With Russian bombers probing our defenses everyday, it's important to stay united. 9/21/2014. On this matrix the axis term is ONE UNITED KINGDOM (BRITANNIA), with a tav used instead of a tet. When looking for terms related to the vote for Scotland to withdraw from the United Kingdom, touching it in the open text is THE LAND WHICH THEY REJECTED. An ELS of QUEEN shares a letter with THEY REJECTED. 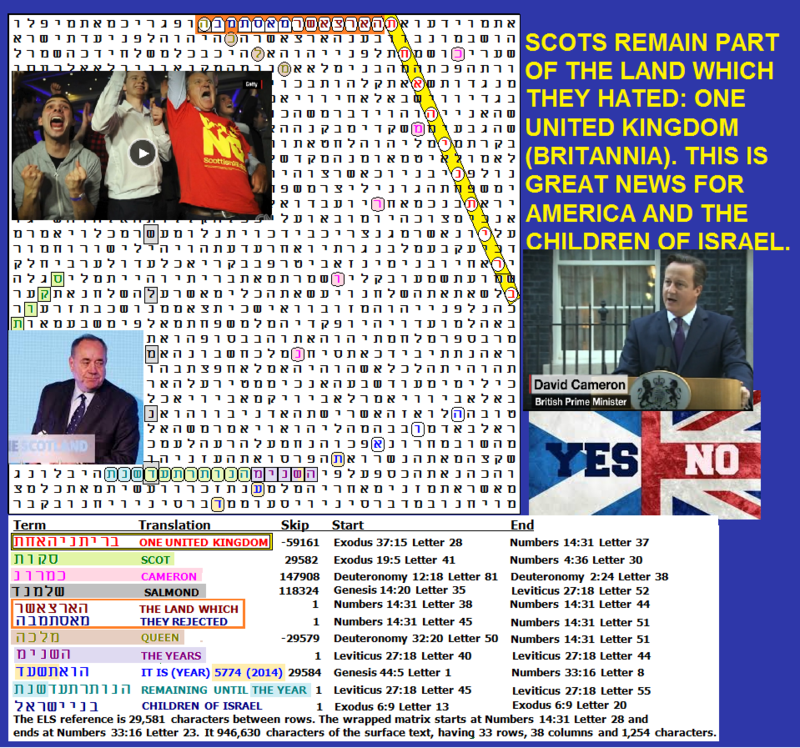 There are ELSs of CAMERON (the Prime Minister), SALMOND (the First Minister of Scotland), SCOT, and the Hebrew year of the referendum, IT IS (YEAR) 5774 (2014). In the open text, sharing a letter with 5774 (2014) is THE YEARS REMAINING UNTIL THE YEAR. There was concern that a Yes vote for independence would force Jews to move out of Scotland where the public sentiment is against Israel and for Palestinians. In the open text is THE CHILDREN OF ISRAEL. Fortunately the Scots rejected the referendum by a vote of 55% for NO, and 45% for YES. SPELLING ISSUES. The odd thing about spelling modern names in Hebrew is that of the two letters that have an S sound the choice in Israel is almost always a samech although shin/sin works as well in a transliteration. Likewise for the two letters with a T sound, the choice is almost always a tet although a tav works as well. However, when it comes to finding modern names at an ELS in the Torah, following the modern Hebrew tradition is generally a disaster. What are the frequency of these letters in Torah? Of 304,805 letters in Torah, there are 1,833 samechs and 15,955 shins or sins. There are 1,804 tets but 17,950 tavs. Effective Codes technique requires search for both spellings for each of these letters, as well as a willingness for a C or K sound to use caf or kuf. On this matrix I had to use a tav rather than a tet in BRITANNIA. So too with SCOT. For CAMERON I used a caf rather than a kuf for the first letter of his name. Four transliterations were sought for SALMOND. STATISTICAL SIGNIFICANCE OF THE MATRIX: Frankly, if the YES vote had carried the day and the United Kingdom ceased to exist, I would expect this event to be heavily encoded. But the NO vote won, meaning that all we got was largely a return to the status quo. That I would not expect would be strongly encoded, and that's pretty much what happened. In looking at the spreadsheet below, all clearly a-priori terms were expected to be there on a matrix this large. The phrase THE LAND WHICH THEY REJECTED was there against odds of about 243 to 1, but it was questionable as to whether it really belonged on the spreadsheet as an a-priori term. While it was obvious that this vote was about Scots rejecting the United Kingdom, the exact phrase was only found a-posteriori. The word for REJECTED is also translated as DESPISED, and there were other terms for both on my dictionaries that would have worked as well. The combined probability for 8 terms - all found against odds of about 7,419 to 1 is deceptively high because of the a-posteriori phrase just discussed. Eliminate that, and the combined odds against the matrix are only about 30 to 1, which is not very significant. However, while I normally do not assign odds to an axis term, this one is 10 letters. How like was it to occur? Codefinder indicates its R value was 1.419. For a brief lesson on R-values see R values. The more positive they are, the more significant they are. (Note: An antilog calculator is here. Use base 10 and insert the R-value into the box for exponents in the upper right). I don't usually worry about the value of an axis term because most often I use terms that are about 8 letters in length, which is the most common limit of what I can find as an axis term. However the 10-letter term ONE UNITED KINGDOM (One Britannia) had a word expectancy of about 0.0381 which means (taking the inverse) it had about 1 chance in 26.24 to be found in Torah at least once. But, look at the 12-letter term FOREIGNER B. OBAMA KENYA found in my article about Obama's possible Kenyan birth. The expectancy 0.0000014256 converts to only 1 chance in 701,455 that it would be in Torah at an ELS. This makes that term really special. Returning to this matrix if I alter my normal protocol and combine the R-value-derived probability for ONE UNITED KINGDOM with the probability for the purely a-priori items, then the matrix was found against odds of about 799 to 1 (which is fair). POLITICAL IMPLICATIONS OF THE REFERENDUM AND LESSONS LEARNED FOR "RED" AND "BLUE" STATES IN AMERICA: A quick scan of commentaries on line about the Scottish referendum showed that the vote was highly correlated with financial well being. The rich voted NO and poor voted YES. In watching the coverage on BBC I noticed that red was used for the NO vote and blue for the YES vote. There were on line comparisons to America's Red States and Blue States (see Jane 24). I have an earlier article about the potential split between Red and Blue States here. I also noticed that while 1.4% of Scotland is Muslim, in Glaskow where the population is 5.4% Muslim, the city voted in favor of independence. There was a tremendous sigh of relief in London when the vote went as it did, but are there parallel lessons to be learned here for America? Perhaps one is then when our time comes to decide on continued unity or separate was for Red States and Blue States, we would do well to be as civil about as the Scots were, rather than repeating the horror of the Civil War. To be sure, Obama has to succeeded in dividing America that there is growng hatred by many white Christians not just toward him, but toward other whites that voted for him. There is a sense that any white person who supports Obama is a traitor. This really scares me as a Modern Orthodox Jew, because what I find here in Cape Canaveral, Florida where I live as that every Christian I meet here (all white, blacks don't live here) is supportive of Israel, but dumfounded by the overwhelming Jewish support for Obama in the last two elections. I find that I constantly have to make excuses for them and point out that Orthodox Jews voted against him, although most Jews (in name) are not Orthodox. My Christian friends cannot understand how Jews can support homosexual marriage. If you know me by now (or read what I write) you know how stringly I oppose such abomination, as do my fellow Orthodox Jews - but they don't live around here anymore than blacks do. So how would I feel about a divided America? Like the Scots who voted NO because of defense concerns I know that my heart is not in a union based on immorality that is backed by almost almost every Democratic Party decision. I guess the difference between the U.S. and Scotland is that there the ultraliberal side does not rule, and here it does. I pray for America to wake up, but in my own family I see members who have left Torah morality is the dust, and it hurts. If the divide does become or move toward becoming formal here, I hope that it won't be a bloody matter, but I am armed in case it ever comes to that. For those who read this who are Jewish I implore you to think carefully about the positions you take. If you support traitors like Obama, or Liberals like Hilary Clinton, and you want to know what difference you position could possibly make, I'll spell it out for you. It's quite common for non-Jews to warn me that another holocaust is coming, and that Jews who reject God will be its target. Meanwhile, F-22 fighers turned away Russian bombers again today from just off our coast. The weaker we get, the more Putin and our enemies push us. But weakness comes not just destroying our military power, as Obama is doing. Weakness comes from destroying our morility, as he is also doing. As Jews must return to Torah, all Americans need to return leaders to Washington with a single creed -In God we Trust.